This wasn’t my first marathon. It wasn’t even my first London Marathon. Now, I’m not saying I’ve been bitten by the marathon bug to the point where a weekend without at least one marathon is a weekend without meaning. (That degree of addiction seems to be for a few only. About half of those with initials LH seem to get ensnared – Leon Hicks and Lisa Hale are beyond cure so we’d better all closely watch Lisa Harrold and Lucy Hale – already marathon experimenters). But still, I had already done 4 road marathons. So you’d think I’d know the ropes, it would be pretty much familiar territory, that I’d take the training and the event all in my stride. Not so – it seemed like every marathon for me had something unexpected – whether good or bad. Brighton (2011) was my debut, a run well beyond my best hopes, and a time which remains my PB by a country mile; London (2012) played its joker with a knee injury in February and 10 weeks out, before a sudden consultant’s OK to run the week before (he’s a runner – he gets it), and a corrective op afterwards; London again (2014) brought a painful injury from nowhere but a time improvement on the one before (3 seconds better? Wafer-thin, but good enough); then Edinburgh (2016) tried to scupper me by erecting a dismaying wall, of nuclear bunker strength, before it suddenly crumbled and allowed 2 flying miles and an inside-target time. So based on that history, London 2017 was bound to be an unknown quantity, and it was, but as usual in unexpected ways. Training was patchy – great long runs, including 20mls inside 3hrs twice to build up hopes, mixed with other running which was ‘informally structured’. (OK then, “random and inadequate”) to bring those hopes back to reality. I also decided on a whim to add another unknown quantity by giving myself a race plan I’d never tried (try for one of those rare negative splits and just let the time be whatever it came out as). So, I had no idea of what my preparation and plan would lead to. Yet even with those “known unknowns”, London still had its surprises. Firstly, a good one in finding an SJ running buddy – Tracy Robinson — in the same pen and planning to do at least half the race at just the pace I had in mind. 11 sociable miles of laughs, chatter, pointing things out to each other and all the enjoyment of not running alone and letting miles just pass and pass again. My plan utterly failing in the second half was not really so surprising, but feeling quite so awful was. The finish time was a shocker – way slower than anything I’d imagined possible (looks like I cared about time after all, huh? ), and the very dodgy physical state for hours afterwards also caught me unawares. And yet…and yet…those tortuous closing miles had the best surprise of the day. 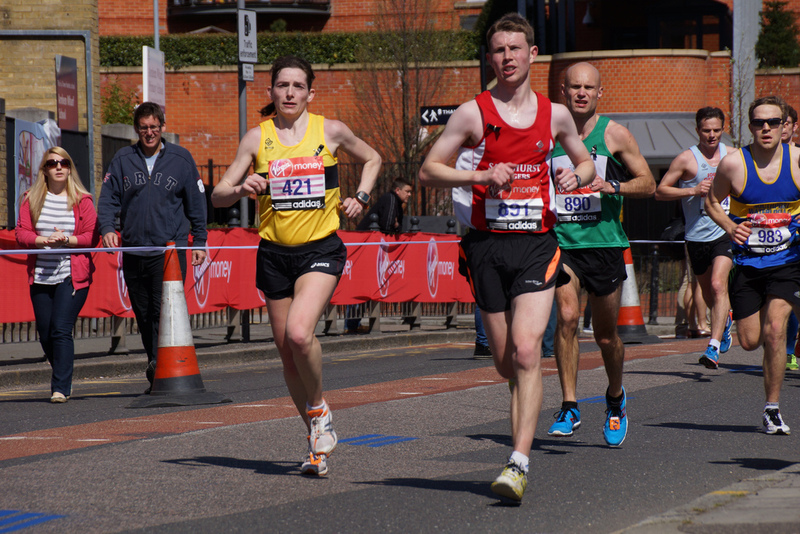 In past London Marathons, I’d frankly had enough of the cacophony of the crowds by the end. I just wanted to have my own quietness as I gritted it out, not comments that were encouraging earlier but had become irritants: “looking good, Ian!”…(no I darned well don’t), “not far now”…(you think that’s helpful with 4mls left? stop lying to me), “you’ve got this”…(oh really? you don’t even know what I want, idiot!) But this time it was so totally different. Individuals were actually talking to ME! One-to-one. We had eye contact. They said the right things to soothe. Their encouragement was heartfelt. They told me exactly what I really needed to hear. And, even though they’d been doing it for hours with countless strangers, right then I was the one they wanted to help. I greeted Colin Jackson on the embankment like I knew him from childhood, and he just acted like I was probably right. The people on the barriers were all so, so good, that I actually started clapping THEM and thanking them. They couldn’t actually put strength in my legs or get rid of whatever was laying me low, but they did everything else they could. They really cared, and showed me that at the worst moments in terms of running, I could still have the best experience, and the most unexpected surprise, that only London Marathon could bring.